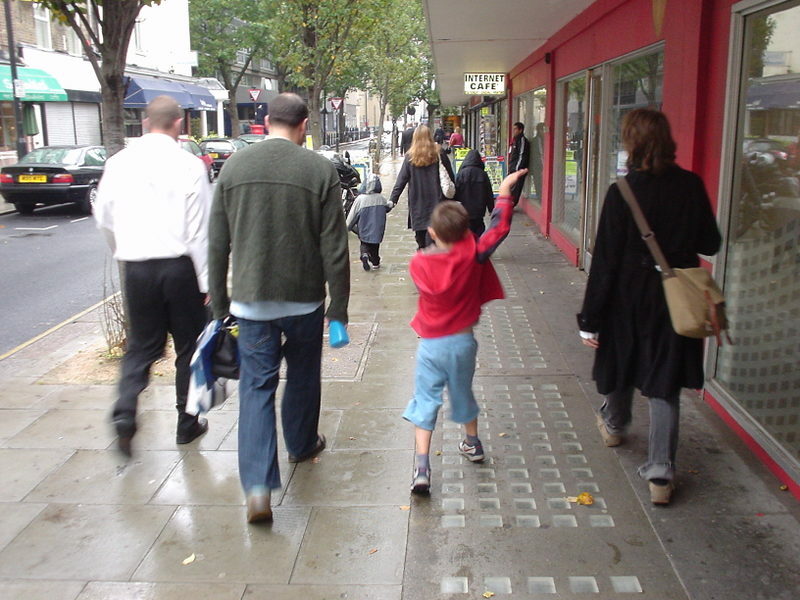 Walking to school behind Russell, Arthur and Anne, I started to remember what a great feeling it is at Arthur's age to move through a complex environment knowing that your parents, the ultimate source of safety and acceptance, are right behind you. As we get older, the need for comfort gets to seem a bit shameful. Which is silly. Marketing, on the other hand, has always treated comfort very seriously, if sometimes dishonestly. But the traditional approach has always been backward-looking, based on the idea that "the past was better". Which is mostly silly. It would be interesting to look at where and how people find comfort today. Is comfort necessarily nostalgic? Can we be comforted by new things? I'm comforted by people being good to each other in places where they're not expected to be. And in political progress (as I define it, of course). Over the past year, I'm comforted by the fellowship and genuine good intentions of the advertising/planning blogsphere. I'm comforted by the general optimism of the conversation. It's helped me to humanize our business again. The french phrase: "se sentir bien dans son peau" (feeling good in your skin) seems to capture it really well. Anything that makes you relaxed and, in a sense, free embodies the idea of comfort creation. That might be the familiar (the past) or that with which you identofy. Don;t you think (if you follow your argument) that marketing has used both dishonestly? Living in Post-Katrina New Orleans - comfort has become a focal point of conversation. Specifically, what we (as a community) have done to find it. In some cases I think comfort can be in people, but also in places and activities... normalacy if you will. Can you find comfort in new things... I'd say yes. If those new things involve the reconnection or consumption of old things that you associate with normalacy or stability. I'm seeing a lot of people trying to comfort themselves as they move through an unfamiliar environment by bringing reminders of 'another place' with them - for example, a goodly proportion of an urban population plugged into their i-Pods. Which seems a little strange, as they're cutting off one of their senses from being able to scan that new environment, and therefore lessening their chances of responding to it appropriately. Clutching a cup of coffee is another favourite comforter. I think people are conforted by the familiar in their lives. That's why we get attached to places and even brands. The feeling of security attached to a repetitively happy experience is comfort. so maybe forward-looking comfort is very unlikely. because there is no repetition to acknowledge happiness. just expectations. I'm finding as I travel around that I'm comforted by the Web. Anywhere I go, whatever device I'm using, I can access something that's largely familiar but changing. If it were always the same (like the past, in general) it wouldn't be as comforting I don't think. There's something about responsiveness combined with familiarity that makes it comforting. Even the most reluctant people like new things, as long as the things make sense. I just finished reading product/interior designer Karim Rashid's book Design Your Self. I'm interested in Karim because of the ideas that motivate his work. He believes that flooding our lives with new shapes, textures and experiences will lead us to pleasurable and curious lives. I could temper Rashim's enthusiasm with a "new things are inherently scary" remark, but that's too simple. For an example, let's look at computers. My day job is teaching university faculty how to do things on computers (scan pages from books, make powerpoints, edit video clips). Almost all of the faculty that come to our lab are scared, letting us know right away that they feel "so far behind with all this computer stuff." This usually means that they view computers like a really complex 20th century machine that can be permanently damaged by innocuous misuse. As important as making clear explainations and walk-throughs are, it would all fall on deaf ears without "educational salesmanship:" keeping a positive attitude, explaining how scanning will save time and effort, making sure their chair is at the right height and they don't feel uncomfortable and stressed, et cetera. Most of the time it pays off. They feel empowered with their new abilities and sometimes even excited to learn more. Conversly, imagine the unveiling of the waffle or the clothespin. Nothing scary. It's all very clear how this will make your life easier of more fun. Same with the iPod? It's a question of introductions. Not everybody is going to seek out new experiences in the way that young people do, but we're all ready for new things if we can see how they function and what they'll do for us. Every one knows that men's life seems to be very expensive, nevertheless different people require money for different issues and not every person earns enough cash. Thence to get fast mortgage loans and term loan will be a proper solution.